Mike Press has a lot of admirers. He’s been making wine for decades, for Penfolds, Seppelts, Krondorf and Mildara Blass in the role of chief wine maker. 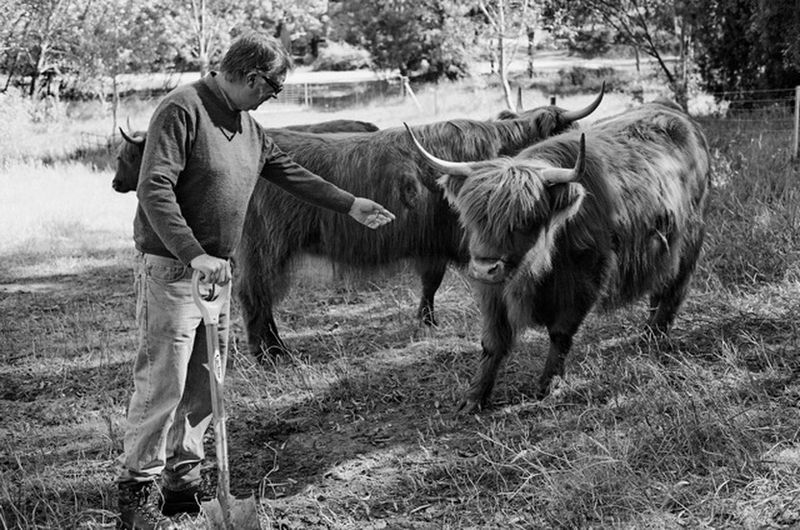 In 1998 Mike and his wife Judy planted their Kenton Valley Vineyards high in the Adelaide Hills. Early success saw a clean skin they made in 2005 become runner up for the Jimmy Watson Memorial Trophy for its 2005. Their 2005 Shiraz, Cabernet and Merlot won three trophies and seven golds in 2006 at the Adelaide Hills Wine Show. Mike Press Wines blows all else out of the water when it comes to value this year, with an average price of well under $13, a full $5 less than any other estate in the Wine Taste Weekly Hall of Honour. Order direct and you’ll pay even less. Nine wines take the credit for this result, spanning seven varieties from this sensational single vineyard high in the Adelaide Hills. The wine is kind of compact, a bit like Mike is built, with a good concentration of red fruits on the middle palate and a touch of soft oak. It’s barely a year old but drinkable already, yet with plenty of headroom for growth. It’s not huge but it’s not exactly subtle either. Tyson Stelzer gives it 94 points, so does Campbell Mattinson at the Winefront. I saw it more as a 91/92 point wine, which is pretty good for the money ($13). ‘We’ve been on the Mike Press case for some time now,’ says Campbell Mattinson at the Winefront. ‘We may even have been the first publication to publish notes and raise the alert on his wines. The shiraz and cabernet sauvignon are always good value, but not always – contrary to the opinions of some – compelling quality. It’s a single vineyard; the wines have their ups and downs. When the stars are in alignment though, value red wine buying in Australia doesn’t come much, or any, better. “Mike Press celebrates a half-century of winemaking this year,’ writes Tyson Stelzer. ‘It’s been seven years since I first started avidly tracking his work, and in this time his vines have precisely doubled in age. His shiraz style has grown up with its vines, from the precocious, peppery wines of the early years to a deeper personality of great black cherry and plum fruit presence, epitomised in the spectacular seasons of 2010 and 2012. ‘Lifted violet perfume, succulent blueberries, intense liquorice and pepper are the hallmarks of the new Mike Press style. The biscuity, milk chocolate presence of American oak is prominent, as it always is in Mike’s early release reds, demanding plenty of time for fruit and oak to settle into place. It’s got all the engineering to go the distance: beautifully textured tannins, enlivened by the naturally vibrant acidity of this lofty site. 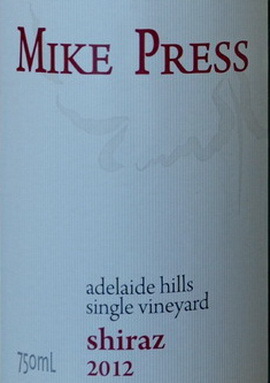 2012 is the most complete Mike Press Shiraz to date: concentrated, confident, mesmerisingly persistent, and at every moment refined and graceful.” 94 points. I thought I’d open a bottle of this while I was writing about Mike Press. It’s bigger than I remember, but not huge at 14%. The colour is a good, solid mid-red; the subdued nose doesn’t speak of Shiraz with the sour cherry, spicy notes you’d expect from a cool climate Shiraz. The flavour is straightforward and one-dimensional, the line of acid seems a bit awkward and the wine finishes short. I’d give it 88. Campbell Mattinson gave this 89. I have to say I don’t see what Richard Warland sees in these wines – on the billboard – not in the 2010 or the 2012 which shows its charms readily. The 2012 Shiraz is the better of the two, but it’s just about vanished from the market. Randalls still has some for $14 a bottle or $13 as part of a dozen. The 2013 Sauvignon Blanc is $11 at MyCellars, and the 2012 Cabernet $12.50 at Winelistaustralia. I have to add that what Mike and Judy are doing really hits our sweet spot in terms of value, and we promise to pay more attention to their wines in the future. These days, you could add old vines and biodynamic to the list. Have I missed anything? 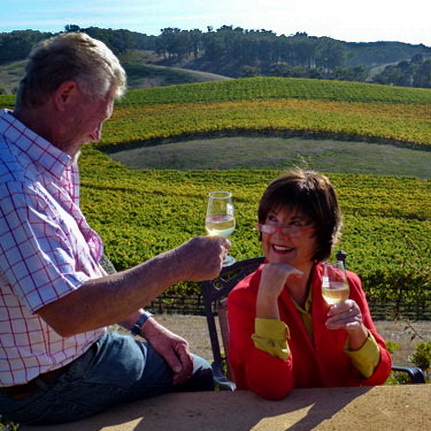 Mitchell is Clare Valley royalty, and Jane Mitchell has just been made one of only 6 Clare Valley Legends. The biggest surprise is that the wines are affordable. So why isn’t Mitchell more popular? One answer is that the slick young sommeliers in the big smoke don’t have Mitchell on their list of trendy wineries. As a result, Mitchell is one of the country’s best-kept secret. The Clare’s best whites are Rieslings, and the phrase ‘Australia is blessed with the unpopularity of Riesling,’ is attributed to Andrew Mitchell. That hasn’t changed despite big names like Brian Croser/Petaluma and Jeffrey Grosset pushing hard to put their Rieslings up there with the best. Quelltaler used to make great Semillons, and Andrew Mitchell makes a fine Clare Semillon today. The once fashionable variety Chardonnay and Sauvignon Blanc don’t make great wines here, no one knows why not. Clare’s reds have long been underrated as well – Cabernet, Shiraz and Malbec have long flourished here, with a bit of Grenache added in recent days. Anyone remember those great Stanley Leasingham Bin 56 Cabernet Malbecs of the seventies? Tim Adams learnt his craft from Mick Knappstein at Stanley, and he still makes a good Cabernet Malbec . When my late wife and I visited Mitchell’s winery in 1980, Jane and Andrew greeted us in the old stone apple shed. Their first daughter was a toddler then, crawling around the wooden floor. Andrew tells me she is now a chief designer in a famous Spanish company in Barcelona. The rest of the Mitchell clan have stayed behind and seem to work in the family business. Back in 1980, we loved the 79 Riesling, which typified the Mitchell style: big flavoured, full-bodied Riesling with a strong backbone for aging. It’s the kind of Riesling they try hard to produce in Alsace in a good year, and it sells for less than $20 in Sydney. The Semillon is made from ripe fruit and matured in oak. It’s a different style from that of Hunter Semillons, and released at 5 years of age but benefits from more years in the cellar. 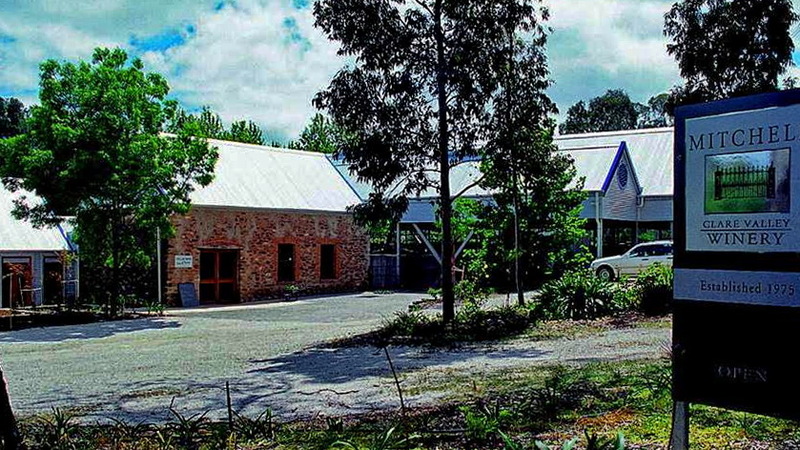 The Semillon, the noble Semillon and the sparkling red are winery direct orders, as are the Premium range of Mitchell wines, the McNicoll range. The reds are also released with some age on them: the current Peppertree Shiraz is 2010, the Grenache, Sangiovese, Mourvedre (an interesting variation on the GSM theme) is 2009, and the current Sevenhill Cabernet is 2006. Even this wine can be bought for less than $25. Details Here. The reds tend to be on the big side, except for the Cabernet which is elegant in cooler years. The other two offer big rich fruit typical of the Clare Valley, but the Cabernet is a more savoury style with dried herbs and leathery, earthy flavours – these are great food wines. Terroir – has Technology triumphed over Origin & Character? In the sixties and seventies, Coonawarra made fine ‘claret style reds’ that were often compared to the elegant reds of Bordeaux. There were mint and wintergreen characters, and Owen Redman said he could smell the pines in his reds. You would never confuse a Coonawarra Shiraz with one from the Barossa in those days, let alone the Hunter. In the 1980s, Lindemans made Coonawarra reds with ripe, jammy, stewed overtones and a few years later Doug Bowen’s once well-balanced reds hit 15% alcohol. Most makers in the area followed suite and began making big, ripe reds that were hard to pick as Coonawarra reds. And it hasn’t changed, as the 2005 Brands Coonawarra red in front of me proves with 15% on the label. More details here. The writing is lively and colourful, like he’s chatting to you after a big lunch across a cleansing ale. He’s direct, in your face much of the time but what he talks about keeps me turning the pages. Most of all because he’s filling in some yawning gaps for me. This is my second time around the world’s vineyards, after a long break. The reason I took the long break was a world of wine that had turned into Theatre of the Absurd. Not so long ago, even the best French wines were affordable. OK, it was the early eighties – I keep forgetting that was 3 decades ago. Anyhow, I was on a decent but not especially generous income as a sales manager in the IT industry. 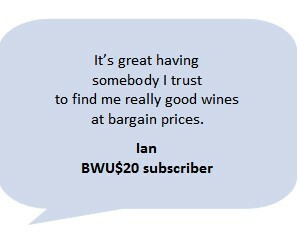 I was buying good quality Aussie wines from Tyrrells, Mitchells, Bowen Estate and Vasse Felix for around $4 – 5 a bottle. Is it global warming, tough Aussie men or smart marketing? Once upon a time, Shiraz was indeed the most civilized of red wines. The most seductive were the reds from the upper Rhone – Hermitage, Cote Rotie etc. – fragrant, medium-bodied reds with peppery, spicy and earthy overtones. We made reds in a similar style: I remember Best’s Great Western Shiraz reds from the seventies that were delicate but long-lived because of their superb balance. And Hunter reds from Murray Tyrrell and Coonawarra reds from Owen Redman in that style. I’ve written many unkind words about Marlborough Sauvignon Blanc, but not nearly enough of them. The stuff is hard to avoid because you run into boxes of it piled all the way up to the ceiling in the big grog shops. And it seems Aussies can’t get enough of it. A couple of years ago, 3 of the top-selling 5 white wines in Australia were Marlborough Savvy: Oyster Bay, Giesen and Stoneleigh. Journalists were talking about a Kiwi savalanche. On their side of the Tasman, Sauvignon Blanc accounted for 70 per cent of New Zealand’s grape harvest in 2011 and 85 per cent of its wine exports. Red flags should be going up all over NZ since putting all their wine bottles in one big basket will make an awful mess when fickle consumers drop it for a new darling (Vermentino?). Can you imagine ripping out all those vines they planted on every sunny hillside of the Shaky Isles? Will Global warming kill Australia’s wine industry? A reduction in the quantity of Australia’s wine grape crop. It looks like Max Allen completed The Future Makers in 2009, the year of the fires that burnt across Victoria and South Australia and destroyed so many lives and homes around King Lake just north of the Yarra Valley. 2009 followed the hard drought years of 2007 and 2008. By 2009, the River Murray was reduced to a trickle, and governments were at last forced to take action to rein in the wanton waste of irrigation water.